Enterprise administrators often tell us they’re spending more time than ever managing their browser deployments. As more and more workers rely on their browsers to get their jobs done, it’s becoming increasingly important that IT teams have a way to centrally secure and maintain Chrome so they can provide an optimized browser experience for their end users. Last year we released Chrome Browser Cloud Management, in beta, to provide administrators a simpler way to manage Chrome Browser in the cloud. We’re really excited to dive deeper into this new feature, which was announced at Next ‘19 and is now generally available for enterprise customers. This week at Google Cloud Next we hosted a session, Manage Chrome Browser from the Cloud, with Joshua Chadd, a systems engineer at Starbucks. If you listen to the session, Joshua shares how his team was able to gain a centralized way to manage browsers across operating systems, provide a more consistent browsing experience, and gain more visibility into the important areas of their browser landscape, such as extensions and device information. Here are some of the reasons why Starbucks and other enterprises have adopted Chrome Browser Cloud Management. 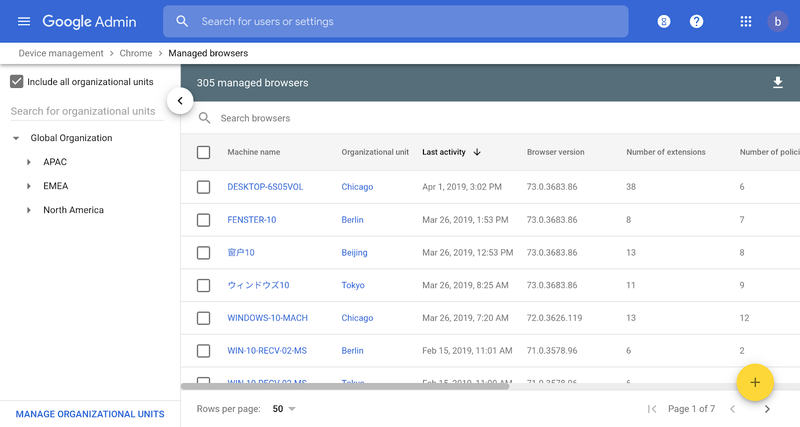 Chrome Browser Cloud Management lives within the Google Admin console, and it allows you to manage browsers in your Windows, Mac and Linux environments from a single location. You can see your enrolled browsers, and set and apply policies across them from the same place. 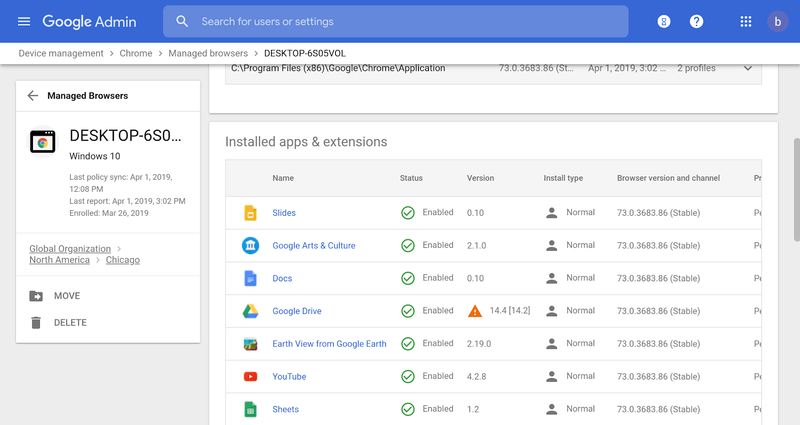 If you are already managing Chromebooks or G Suite, you can automatically access all of this from the same console. Many business users gain tremendous value from the Chrome extension ecosystem. Enterprise software providers also make Chrome extensions available to optimize their applications. But IT teams want to maintain control over which extensions are used in their enterprise. With Chrome Browser Cloud Management, IT can get a full organizational view of extension usage, and drill down at the machine level. They can get instant access to extension details, making it easy to decide which extensions to block or allow in their organization. It introduces a whole new level of control around extensions that will help enterprises improve their extension strategy. Few organizations have visibility into their browser landscape, making it difficult to make technology decisions related to web apps and web security. With Chrome Browser Cloud Management, IT can access important information about versions, device type, applied policies and more. They can also export data to leverage it in other systems or tools alongside other important information. 1. 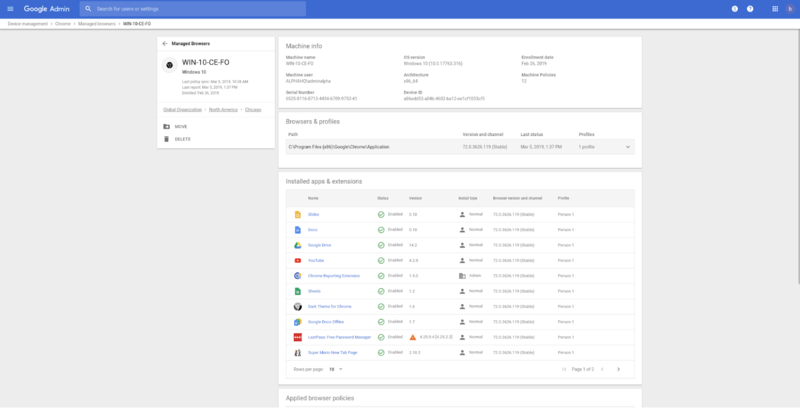 If you’re a G Suite, Chrome Browser Enterprise Support, Chrome Enterprise license, or Cloud Identity customer, you already have access to Chrome Browser Cloud Management right in the console. You’ll find it within the Device Management section. All other administrators can try out Chrome Browser Cloud Management by creating an account. Since you’ll be managing the browser at the machine level, your users will not need their own accounts. 2. Once in the console, you can kick off a simple enrollment process to populate the browsers you want to manage. 3. Once enrolled, you can view browser inventory and data right away. You can also build out the structure of how you want to manage your browsers, and start setting policies.